A hack-a-thon is a long standing developer conference tradition. Coders create something new during a specified timeframe, and then show and tell onstage. There might be a prize – there are definitely bragging rights. In recent years, especially within the Salesforce community, we’ve seen the rise of the demo jam – a lightning round showcase where a roster of software vendors pay to do a short demo and pitch their product. Viewers get a little taste of a lot of different apps. We believe that the demo jam format is valuable because it allows vendors to show their wares and audience members of all stripes to get exposure to new things The downfall, in our opinion, is that it’s inherently sales-y. This can be a turnoff to some attendees. Also, the short format doesn’t allow for the juicy tech-y details developers want to see. We also believe that hack-a-thons are a fun way for developer attendees to learn something new, and show off their chops. The negative here is they’re usually time consuming, and they bring limited value to vendors who’ve paid a lot to sponsor. As conference runners, our job is to embrace the tension between what sponsors need and attendees want. We need to strike the right balance and bring meaningful value to both groups. Our vision is to take the very best parts of these types of events, and combine them into the perfect hybrid – the Hack-a-Jam. Participants will have the chance to demo and pitch their app onstage – but with a twist. We want you to show us how developers or admins can extend your app – to do something custom. We love the platform aspect of Salesforce, and we want to see how your app has embraced that. We want to get a taste of the possibilities. ISV’s get to show their app to the entire conference audience, and attendees get a deep, and meaningful enough taste of each one to actually learn something valuable – even if the app is something they would never buy. It’s a win-win. For Forcelandia 2017 we’re offering a place in the hack-a-jam to ISV’s who sign on to sponsor the event. * We only have 7-10 spots available. If you’d like to inspire the audience of tech influencers at Forcelandia with the possibilities of your app, get on the list today. Keep in mind – this will be a curated event, so we will be vetting all the proposed presentations – but don’t let that stop you from throwing your hat in the ring. As an added bonus, all sponsors who participate in the hack-a-jam, will receive special access to demo coaching by our hack-a-jam host, Salesforce MVP Joshua Hoskins*. Josh is a veteran hack-a-thon and demo jam organizer, participant, and host. He co-founded the original Salesforce Community conference, Dreamforce to You in Florida in (2010), and has been coding since he was in high school. This is just one of the benefits of being a sponsor of Forcelandia. We’ve got a lot of other exclusive goodness in store for the ISV’s who honor us with their support. Drop us a line in the sponsor interest form, and we’ll share all the details! 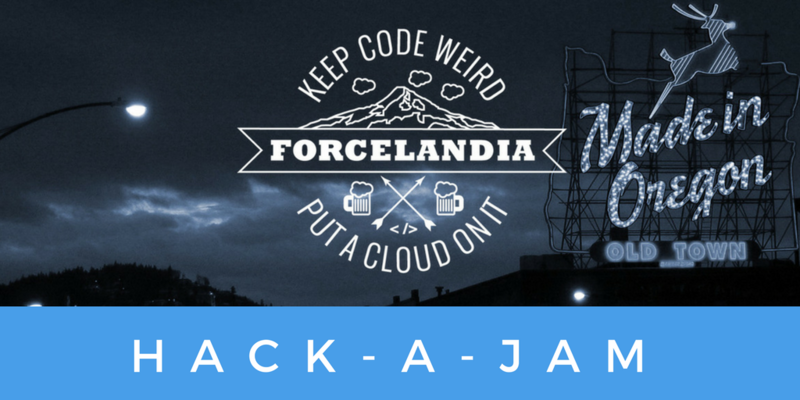 *Note to be part of Joshua’s exclusive Forcelandia Hack-A-Jam coaching group – you need to sign up to sponsor by Wednesday, June 21st – so get on it!! What do you think? Are we off our rockers? Have any Demo-Jam or Hack-A-Thon stories to share? Tell us in the comments, we’d love to hear.